I have loved working with horses since the age of 9, when I first took riding lessons. Born and raised in Germany, I left in 1978 right after finishing high school, departing on a drizzly, grey day leading two Lippizan horses towards the train station in Hamburg, where I had joined a traveling circus as part of the horse act. The circus conducted me to Eastern Germany, Belgium and France. Next, I settled in southern France for a few years, obtained a "certificate of proficiency" in French by studying at the Alliance Francaise in Aix-en-Provence, and worked in organic farming at a place run by the Institute of Ecotechnics (IE), a London-based organization. In 1981 I joined a traveling international theater company and traveled with them inside Europe, and to USA, Canada, and Mexico. Finally, the theater tour ended in Santa Fe, New Mexico. There I began a new adventure. While working on a small ranch near Santa Fe, New Mexico, I trained a horse specifically to trek the old cowboy trails of the "wild west." Samir, my Arabian horse, and I followed the Santa Fe trail to Dodge City, Kansas, and then the famous Chisholm trail to Fort Worth, Texas. Traveling 1200 miles in 7 weeks, with a lot of newspaper publicity, we arrived in Fort Worth, precisely as planned, at high noon on September 29, 1983, for the grand opening of the Caravan of Dreams, the performing arts center who had sponsored the ride. There was a staged "shoot-out" as I entered town. In Fort Worth I met an Australian Station (Ranch) manager who offered me a position on a vast 300,000 acre cattle and horse station in the outback of Western Australia. I spent 8-9 months each year there, working with aboriginal cowboys, rounding up and training horses, moving from camp to camp, mustering cattle. We branded, sorted, weaned the cattle, sold some, put others back out to pasture. An opportunity opened to work with the Biosphere II project in Tucson, Arizona, where I was in charge of the domestic farm animals being selected and raised for inclusion into Biosphere 2, and to a certain extent of the agricultural system. It was during the selection phase that I became so aware of the wide variation among domestic farm breeds, a variation that almost equals that of the domesticated dog, and which is being sadly lost by the uni-focus of agri-business. Upon completion of my commitment with the Biosphere project in 1992, I entered the University of Arizona's Animal Science program, graduating in 1996 with a BS in Animal Sciences. Working part-time as a veterinarian's assistant to support myself while attending the university, I was able to pass the examination to obtain a State Board Certified Veterinary technician license. I formed Heritage Breeds Southwest in 1998, concentrating on preserving domestic animal genetic diversity as adapted to arid lands. I am on the Board of Directors of Rare Breeds International (www.rarebreedsinternational.org). I am a full member of the Longriders Guild (www.thelongridersguild.com). 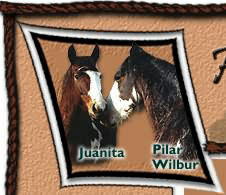 I am secretary for the Spanish Barb Horse Association (www.spanishbarb.com). On February 2004, I was elected a Fellow of the Royal Geographical Society (with the Institute of British Geographers, www.rgs.org). I remain active in national and international conferences concerned with preserving heritage breeds of livestock and poultry and give lectures and presentations on the subject. I am fluent in German, English, and French. However, I am mainly a "hands-on" person who likes to work on outdoor projects. At this time I am also an Elementary teacher in Silver City, New Mexico. My dream project is a "travelling farmpark", including an exhibit for school children to learn about farm animals and their remarkable diversity - which have been adapted through the ages to different ecosystems - and to help preserve heritage breeds.